How do we reach those students who could contribute so much to society, yet often find themselves on the outside of the higher education system looking in? How do we guide them back on course so they elevate those around them, and the community works together as a healthy whole rather than as fractured parts? They are the young men and women whom many might cross the street to get away from. Most have dropped out of school multiple times. Many have served time in prison. Many would call them gang bangers, drug dealers, or criminals because of what they do. No matter what a student’s educational path may look like, anyone should be able to navigate toward a college degree. We call them core influencers. We believe disruption isn’t who they are; it is what they have done. Our core influencer theory contends that those who have the charisma and personality to lead peers into crime and other forms of disruption also have what it takes to lead neighborhoods to constructive behavior that benefits society. By supporting social disruptors, equipping them to earn high school equivalency and then community college degrees and to earn a living wage, we are creating future leaders who can change their neighborhoods from the inside out by staying and positively influencing from within. Our college retention rates are 57 percent, with is higher than the national average for students ages 20 to 24. Without education, core influencers are two times more likely to be incarcerated, are unemployed at double the rate of their peers and cost their communities thousands of dollars in services. If we give them the education and resources to hold jobs that pay well enough to meet their needs, they become an important asset to help end generational poverty instead of being a drain on society. Our colleges and universities will become a truer reflection of the diversity that is the hallmark of our nation. It can change the education conversation from being about exclusion and failure to one of hope and opportunity. Many education programs use the gradual approach of plucking promising youth out of impoverished neighborhoods so they can leave and succeed elsewhere. This removes a potential source for change from the community and leaves behind those who don’t fit the “most likely to succeed” model. The individual success of some does nothing to change the neighborhood in which they were raised and where so many still reside. Other programs focus on helping youth obtain jobs as a means to escape poverty. They teach them skills such as preparing a resume, interviewing, or filling out an application. But without a college degree, the jobs they get won’t lift them—or their children—out of poverty. The path to a bright educational future isn’t always smooth, nor is it straight. For students who face systemic generational urban poverty, it can take some very sharp and dangerous turns. Lacking access to the education necessary for jobs that earn a living wage, impoverished youth often get caught in a downward spiral of crime-involvement or welfare-dependency that is almost impossible to reverse. No matter what a student’s educational path may look like, anyone should be able to navigate toward a college degree. Our society will be enriched as a result. 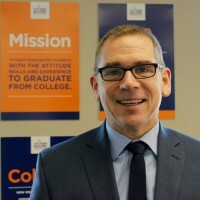 Mark Culliton is the chief executive officer of College Bound Dorchester.